Use this space to jot for paragraph 1. Use this space to jot for paragraph 2. Use this space to jot for paragraph 4.. 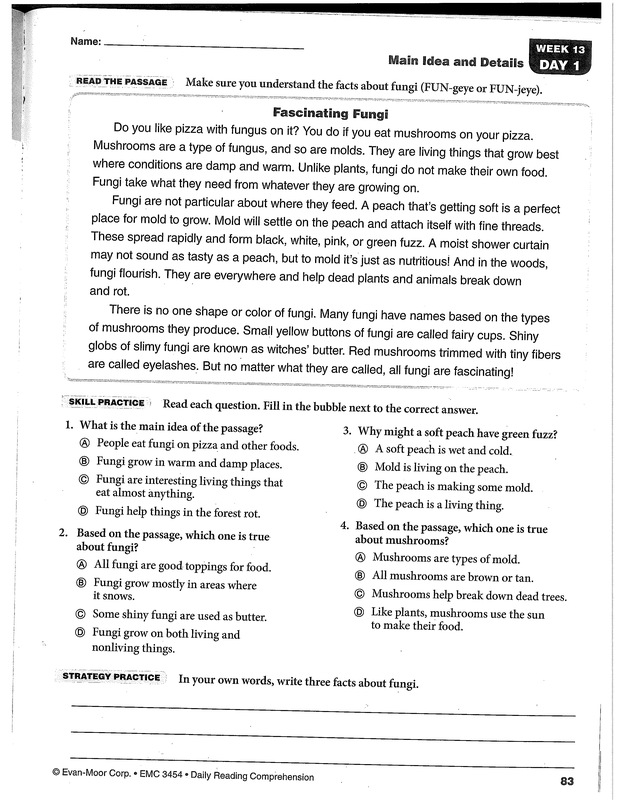 In your own words write 3 sentences that contain facts about fungi. In your own words, explain how we can decide the structure of a text. Sequence is the type of text structure that is used in "Fascinating Fungi" How do I know this? For each paragraph, state a step that helped you understand that "Fascinating Fungi's text structure is sequence. A People eat fungi on pizza and other foods. B Fungi grow in warm and damp places. D Fungi help things in the forrest rot. Show your text evidence for question 10. Based on the passage, which one is true about fungi? A All fungi are good toppings for food. B Fungi grow mostly in areas hee it snows. C Some shiny fungi are used as butter. D Fungi grow on both living and nonliving things. Show the text evidence used to answer question 12. Show your text evidence for question 15. Why might a soft peach have green fuzz? A. A soft peach is wet and cold. B Mold is living on the peach. C The peach is making some mold. D The peach is a living things. Show your evidence for question 17. Based on the passage, which one is true about mushrooms? D Like plants, mushrooms use the sun to make their food.